Shield maidens speed painting tutorial. 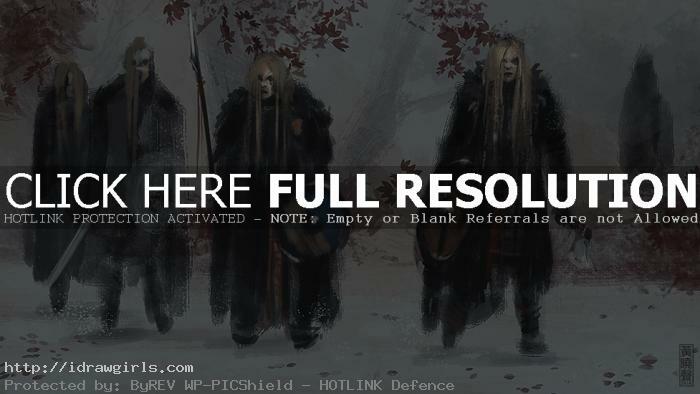 This tutorial shows you how I paint a scene with a group of shield maidens in Photoshop. I also include step by step process. Photoshop is widely use in entertainment industry, including film studios and video games as visual development tools. Speed painting is the first step in visual development process. It is similar to a sketch before a finished painting. I usually have some story or event in mind before I start painting. This concept is inspired by the show Vikings and HBO Game of Thrones. I borrow the looks and feels of the costume design and the mood in the scene from both shows. Shieldmaidens are the Viking Age women who took part in warfare. Stories of Viking warrior women are found in a number of historical documents, but several come from factually unreliable heroic sagas. I personally believe Shieldmaidens were real. Tips on Shield maidens speed painting. Keep it simple first and make your image clear and easy to read or identify. 3) Overall Design and forms. Below are step by step painting Shield Maidens tutorial.